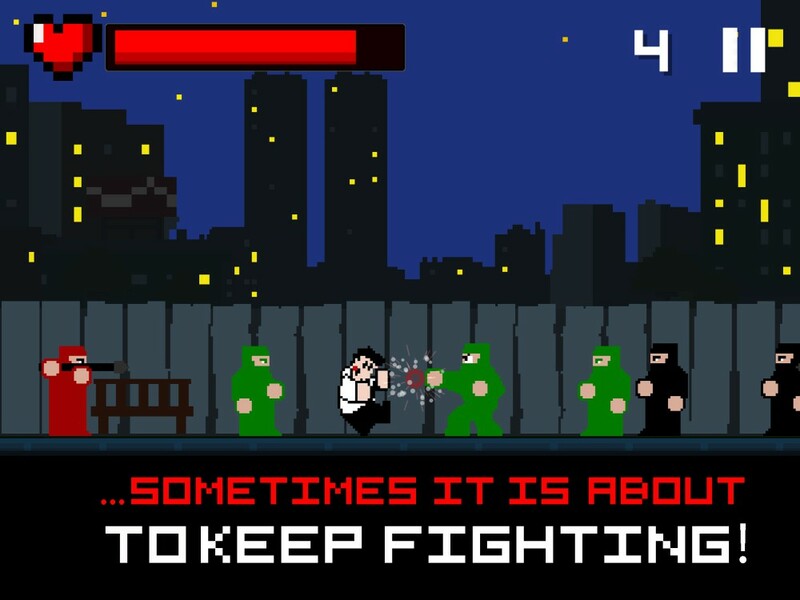 Eternal Fighter by Secret Weapon is an old school arcade casual game where you fight ninjas to rescue your girlfriend. 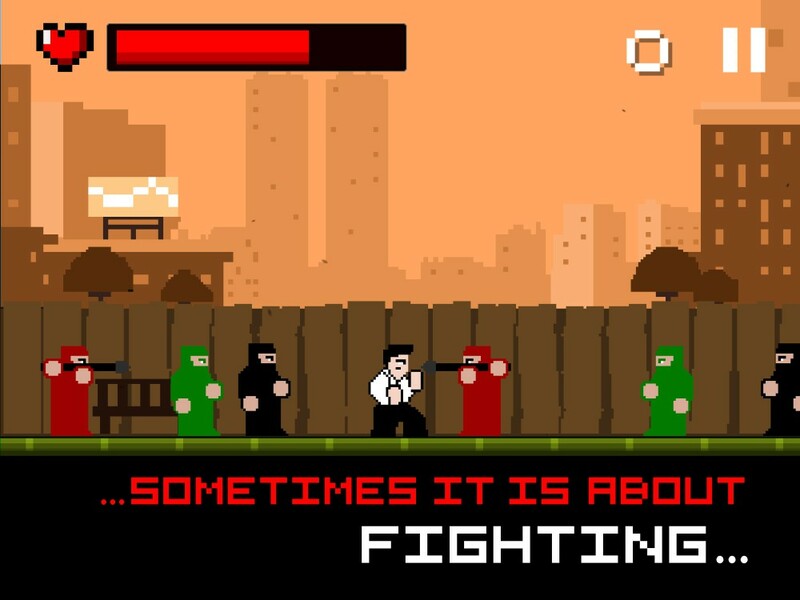 Tap to right, tap to left to punch, kick and smash all the little ninjas! Sounds like an easy task isn't it? It's easy to play but hard to master. Several random environments, addictive musics and a lot of achievements to unlock. 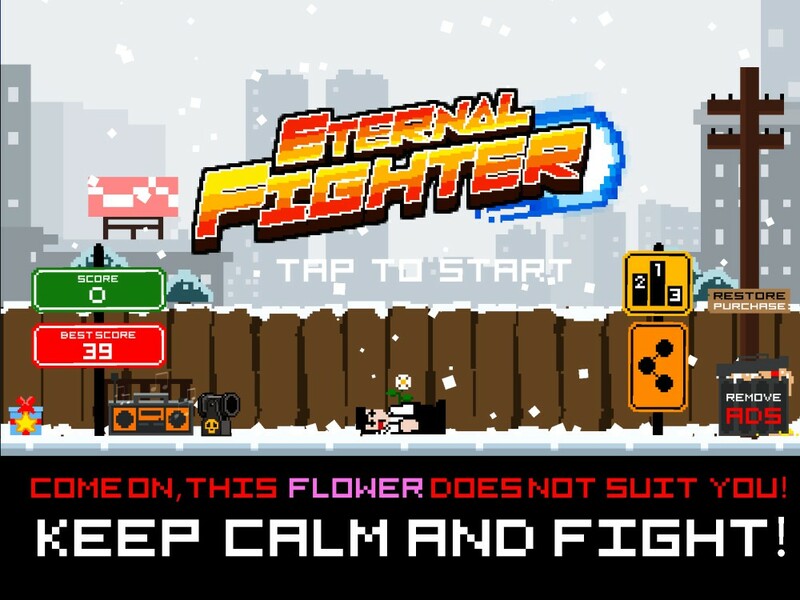 Eternal Fighter reminds me of the game Tales of Clicker Knights RPG for its simple clicking game, Kick or Die Karate Ninja and Iron Snout for its action fighting game. You play as the lone stationary fighter in the middle that has to stand your ground and pull your karate moves to defeat each oncoming ninjas. You have to tap left or right depending on where the nearest enemy is. If you wait too long, the enemy will KO you. The goal of the game is to stay on your feet as long as possible and not get KO-ed. The graphic of the characters in this game reminds me a lot of the 8bit NES game River City Ransom. Compared to similar games, Eternal Fighter is lacking a special signature feature in the game that will keep players remember about the game. Kick or Die Karate Ninja has the special moves that you can unleash. Iron Snout has a wide variety of moves that you can pull while Tales of Clicker Knights has deep RPG system behind the game. Overall, Eternal Fighter can surely entertain retro game fans from the NES era. However, it can use a little bit more features to make itself different and stand out from the rest of the crowd.